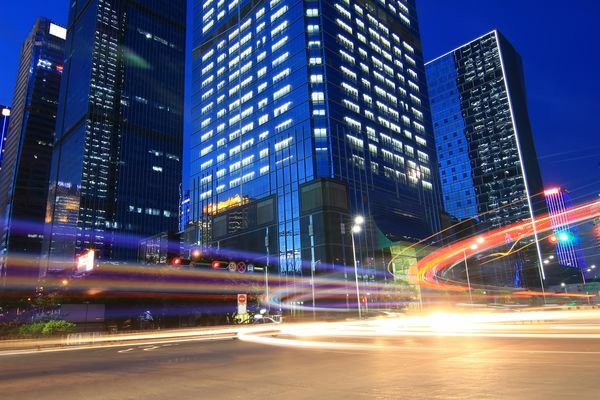 By networking the various intelligent technology systems present in a building, PKE can show you how and where saving potential can be utilized and operating convenience can be increased. This also leads to an increase in building value. "Networked systems for greater convenience and energy savings"
In times of cost controlling and the ongoing search for potential savings, the energy management sector is also placing increasing importance on efficiently finding opportunities for improvement, savings and optimization. Energy monitoring is the solution here—a tool with many possibilities depending on the type of enterprise and equipment in the enterprise, versatile and adaptable in use. 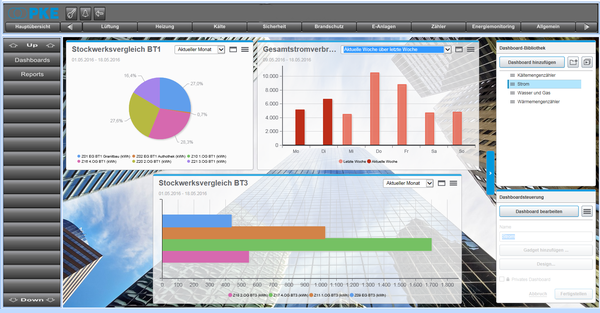 The software aids in monitoring energy sources and recording and evaluating meter data from all meters installed in a building (e.g. electricity, electrical output, heat quantity, cold quantity, water consumption). The data determined by this method can also be used as basis for an audit in accordance with ISO 50001, or for calculating operating costs. We can also create energy flow analyses for you. The only way to save energy is to know how it is distributed in the building. Malfunctions can be identified promptly by running regular, preemptive comparisons to historic data. As a manufacturer-neutral system integrator with many years of professional experience, PKE offers its customers the optimal solution in building automation and networked communication systems. We serve as a professional, dependable partner for installing and revitalizing complex building technology systems. We install systems for situational automated adjustment of building usage. Since modern building automation is moving further into the realm of IT, our experienced specialists have become well versed in this topic. We offer you room automation solutions using all the latest bus systems, including BACNet, Modbus, KNX, or LON. With the help of these products, we develop user-friendly, energy-efficient, individually adjustable and scalable solutions. The focus is on the balance between convenience and energy efficiency. Thanks to years of experience in instrumentation and control engineering system, PKE is an expert partner to our end customers, general planners and housing technology planners in the planning support and design of heating, ventilation and climate control systems. We engineer stand-alone or web-based solutions using high-quality, professional industrial products.